Saturday afternoon brings lots to discover and explore in the city, but sometimes you just want to spend it indoors. If you are searching for a Saturday afternoon activity, consider Millennium Place for a way to play. Every Saturday, unless there’s a swim meet happening, you can find the Inflatables in the pool at Millennium Place. Older children can climb across the obstacle course, and play with larger mats and toys while younger children enjoy the dual slides and climbing structure in the kiddie pool. The fun, family-swim with the inflatables and toys in the pool can be found on Saturday, between 1-6. View the full schedule for Millennium Place, here. 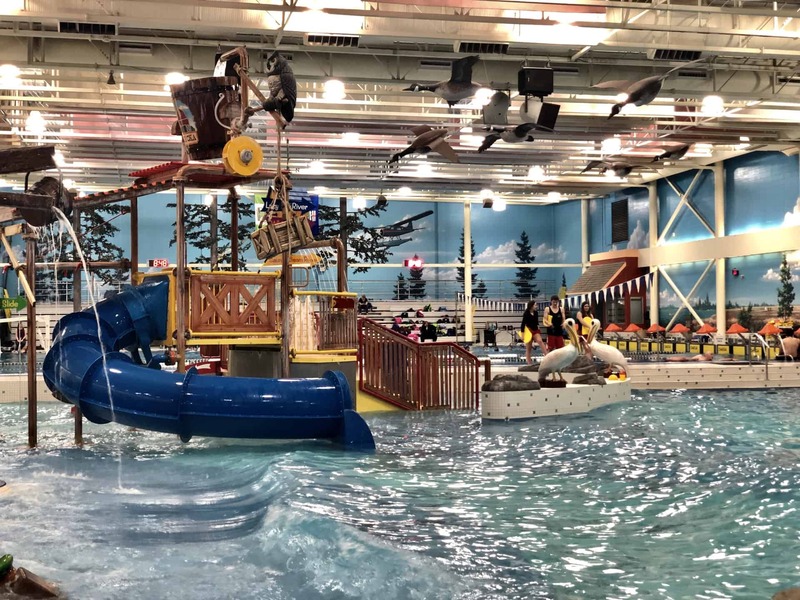 Millennium Place is one of the colder pools in Edmonton and for this reason we choose our long sleeve rash guards for younger kids when we visit. Your admission also includes skating, and the indoor playground. Make a day of it and enjoy at least two of the three activities. You can bring snacks with you, or buy snacks from the cafe. There’s a large cafeteria style area where you can enjoy the snacks with the family! Skates are available to rent, if you want to hit the skating rink after you finish in the pool. There are waves in the kids pool – these waves can be pretty strong, so know this before you go and plan accordingly to have enough parents for the children you’re bringing along with you! Life jackets are available at the pool, children are able to climb on the inflatables if they’re wearing life jackets but children under eight must be accompanied with an adult inside the pool. Have you visited Millennium Place with the kids? Find Millennium Place at 2000 Premiere Way in Sherwood Park. Visit the website for the drop-in schedule, and additional details at www.strathcona.ca.